When you first arrive the lobby/reception area looks ok. But do not be deceived. This hides the dirty and shabby run down hotel behind it. For a "so called four star", it did not live up to this in anyway. Nearer a 2 star and that is being generous. Generally all area's needing a complete clean and over haul. The food was bland at best and slop at worst. (watch out for the mold and cig butts). Entertainment. Well has hit and miss. Nothing throughout the day, and then a quiz now and again, although advertises full entertainment. Staff unhappy and very over worked and stressed. Manager rude and unapproachable. Would not return to this hotel even if free. not a 4 star more like 2-3 star worst all inclusive we have been to in cyprus have been a few times. cleanliness of our very worn out (1970's) room was very poor did not see one maid whole time we were there food not to bad but eat out a lot at near by restaurants staff excellent. entertainment terrible would not go back to this hotel the owner/manager should try doing a bit of work themselves. We went all inclusive to this hotel, after getting it at a good price from lastminute.com. we were quite happy with our stay, nothing over the top, nothing too bad either. Had good food, sometimes the service was a tad slow but this was when it was extremely busy. The room was well serviced and aircon worked fabulously. Entertainment had something for all, which means that what some may find tacky (bingo) others may enjoy, and what some may find highly entertaining (karaoke, greek dancing) others may find as rediculous. but good all-around. Staff and management deserve credit as they really made our stay special and relaxing. We stayed 10 Days in the hotel. 2 Adults and two teenagers, both 15. This is advertised as 4*, but its not. The hotel is looking "tired". The corridors and rooms are very shabby, as are the main areas of the hotel. 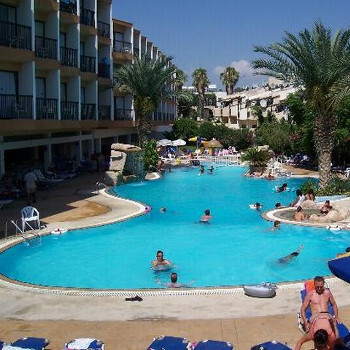 The food is ok and the staff are helpful and friendly.The hotel is kept very clean and tidy. The pool is cleaned daily, but can be dangerous for children when they walk round the pool. The area is very slippery, and we saw quite a few fall and bang their heads. If you stay on the "All inclusive", be prepared to be patient as the service can sometimes be less than efficient, especially at busy times. Paying customers come first!! The evening entertainment is poor. There is nothing for children to do, apart from play pool. Its quite a hike into the town and the harbour area, but worth the effort. The bus stop is outside the hotel, and runs a good service during the day. we upgraded to All inclusive due to the heat and the location of the hotel and the cost of drinks. Hotel was well presented front of house however once in the rooms more like a two star rather than a four star. Hotel food breakfast was ok and enough to get you started for the day. pool food ok and an average choice. Evening meal not much choice for children and we had to wait a long time for drinks. we had to report ants around the serving area to the manager. Soup was always very good. Hotel location a little out of the way not a 2 min walk to the beach more like a 15 min trek. The Harbour was a 5 min taxi ride not a 10 min walk. however buses very good and taxis always available and not much different to the bus for 4. Hotel staff some very friendly however there seemed to be a lot of managers who seemed to enjoy shouting at the young staff for things out of their control. management need to take a more active part in the hotel running. pool area ok pool cleaned every day however the pumps did not seem to be working. the side of the pool was swept every day but never washed down. it is also very slippy children need to take care we saw a few accidents. Our holiday at the Avlida was better than we had expected after reading the various reviews online, which simply put, do not do this hotel any justice. On the plus side, the hotel was very clean allover, our rooms which were interconnected smelt fresh every day. They overlooked the pool which was very thematical about rocks and tropical plantation, the kids loved it. Our aircon was in good working order, and we had BBC, CNN and about twelve multiligual channels on TV. The hotel staff was excellent with us, always attentive and happy to serve, (or so it seemed!). The food was good, snack choices were plentiful, but we mostly stuck to ham and cheese toasties as we always prefered for the kids to have a proper dinner. Entertainment was ok, bingo, karaoke etc. A must is the Cyprus night and the fakir fire show, take a seat early cos the place really fills up. On the minus side, all inclusive ice cream was not served as a dessert for dinner, when the management was asked, they said they would look into it but it was not adopted at least not while we were there. The kids just had some from the bar afterwards. All in all, we had a good holiday and would suggest the Avlida to most types of people. The hotel reception/bar/lounge area and the rooms were kept spotless at all times, however the pool area seemed a little neglected, this may have been because of the time of year. The outside bars were not in use even though there was people sunbathing and swimming. The food was well cooked but not a great choice on offer, the snacks were a lot better than some of the main courses. The hotel is on the main road between Paphos and Coral Bay with plenty of bars, restaurants, pubs and even a lap dancing club next door. The sea is accessed across the road and around the Tomb of the Kings, but there is no beach there. It is just within walking distance to Paphos or there is a bus stop outside the hotel and taxi's are plentiful and cheap. The staff at the hotel varied between the ultra efficient and friendly reception staff to the not so efficient bar staff depending who was on at the time, all the staff at the hotel were always smiling. The entertainment consisted of a guitarist singing and strumming along to backing tapes twice a week, a fashion show one night and a disco one night, the rest of the time there was silence, that could be the time of year again but my view is if the hotel is open, then it should all be open, as mentioned earlier only one bar was open.